My friend Amy Lenord and I are tired of drawing out our primacy/recency map on paper to keep us focused on planning the right stuff at the right time. Click for a PDF of Amy’s version. Well, it was almost just what I needed. 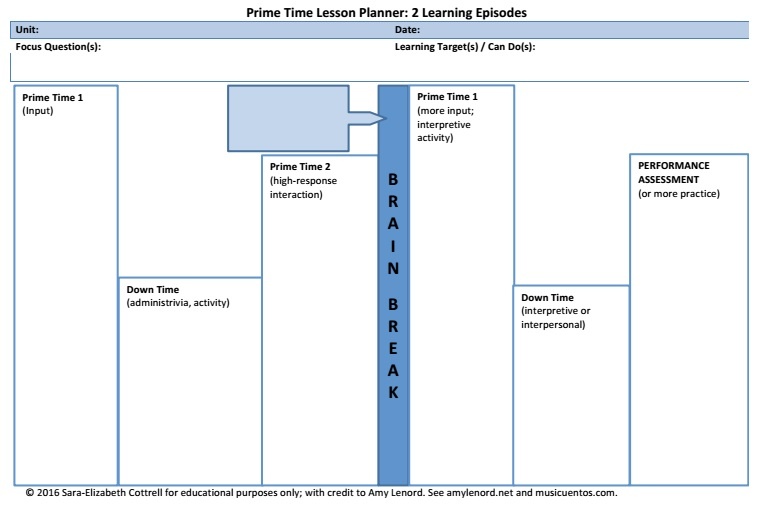 I have 60-minute and 90-minute classes I divide into two learning episodes (Amy’s are only 48, tight for two episodes in HS), so I tweaked it a little for my purposes, and then to clarify for you what I use each section for, I added some notes. 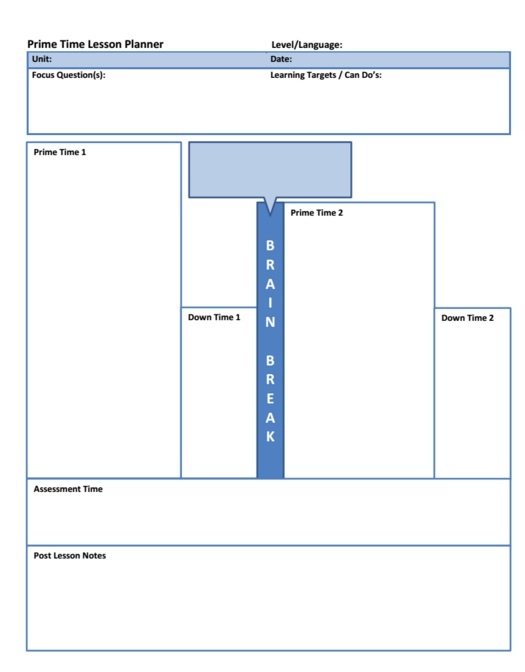 We hope you find these as useful as we do in that daily lesson planning process. Click for a PDF of my version. You can also access mine in a download-and-edit .docx file (Amy’s too), check out my post “Is your lesson plan out of whack?“, check out resources from our CSCTFL workshop The Best Laid Plans, and definitely check out Chapter 3 in The Keys to Planning for Learning (and join the whole LangCamp crew in discussing it this summer!). Oh- and don’t forget you can join me (and other collaborative language teachers like Laura Sexton and Bethanie Carlson-Drew!) at one of three Camp Musicuentos curriculum development workshops (KY, NC, and RI), and the third day we’ll focus completely on how to put daily goals into a brain-based lesson plan that moves from comprehensible input to student production of target features. This is awesome! Thanks so much for sharing your work, ladies!